This is the first same month year-over-year increase in miles driven (April 2009 compared to the April 2008) since November 2007. Of course gasoline prices have increased sharply since April. The EIA reports that gasoline prices have increased from about $2.10 per gallon in April, to $2.70 per gallon in June - and that will probably impact miles driven. Travel on all roads and streets changed by +0.6% (1.4 billion vehicle miles) for April 2009 as compared with April 2008. Travel for the month is estimated to be 249.5 billion vehicle miles. Cumulative Travel for 2009 changed by -1.1% (-10.0 billion vehicle miles). 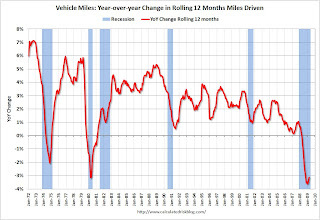 The first graph shows the annual change in the rolling 12 month average of U.S. vehicles miles driven. Note: the rolling 12 month average is used to remove noise and seasonality. 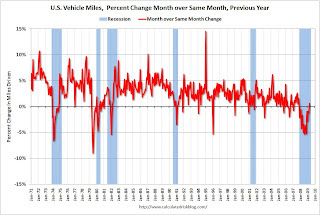 By this measure, vehicle miles driven are off 3.1% Year-over-year (YoY); the decline in miles driven was worse than during the early '70s and 1979-1980 oil crisis. Note that rolling miles driven has a built in lag, and miles driven was larger in April 2009 than April 2008. The second graph shows the comparison of month to the same month in the previous year as reported by the DOT. As the DOT noted, miles driven in April 2009 were 0.6% greater than in April 2008. This is the first same month year-over-year increase since November 2007. Year-over-year miles driven started to decline in December 2007, and really fell off a cliff in March 2008. This makes for an easier comparison for April 2009.